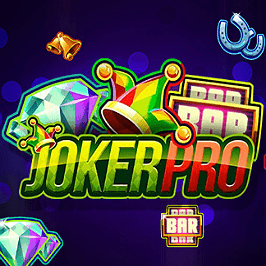 If you like a bit of glamour and glitz when you game, then the Joker Pro slot from Net Entertainment will be right up your street. The bold neon look gives a futuristic vibe, but it's a classic game at heart. 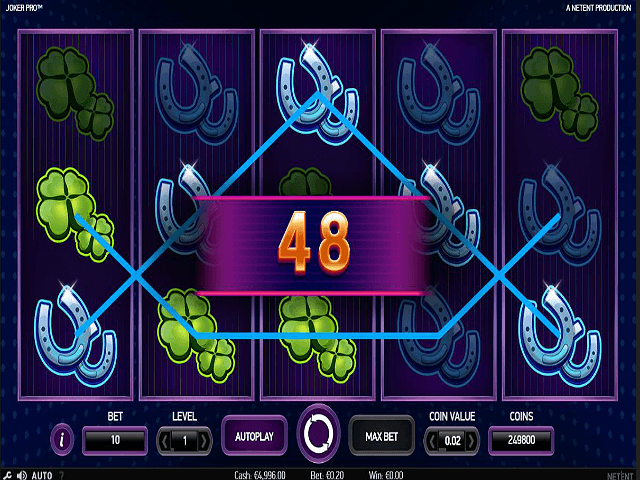 You'll feel right at home as soon as you start spinning the five reels with ten paylines. 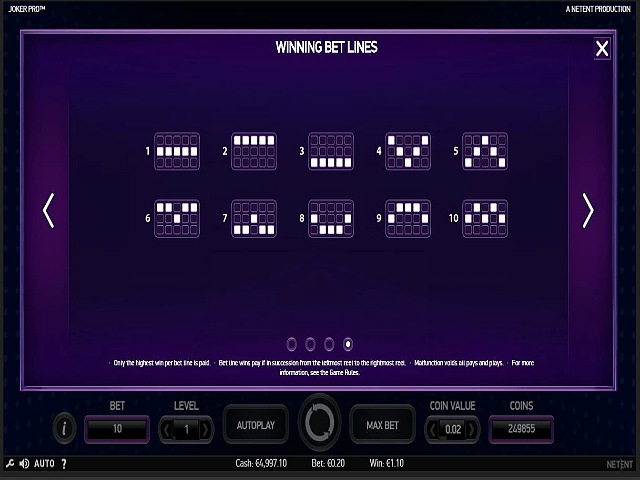 Net Entertainment is known for its simple and easy-to-play offerings, and this is no exception. You'll be able to grab a few spins on the go without having to worry about complicated game modes. There's a wide bet limit (starting at 10p per spin), and the bonus feature really stands out from other slots. Stylish but concise. That's the best way to sum up the approach of this online slot. It gives you the experience of a modern casino, complete with relaxing but encouraging music, without being too in your face. The graphics are bold but clear, with a purple and blue palette that gives it that modern look. The animated background is a nice touch, too. 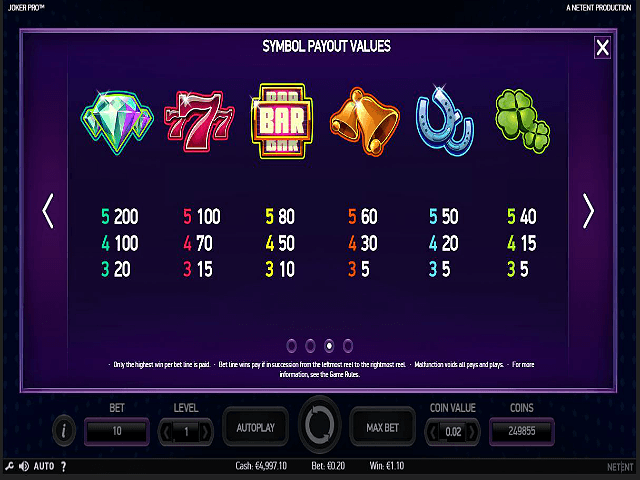 All the bet and coin info is clearly laid out along the bottom of the screen, and the symbols are bright and clear, with a slightly futuristic style that lets you know you're not playing an old-school slot. The symbols are classic references to slot gaming – you'll find diamonds, bells, lucky clovers and horseshoes, plus a few others. If you can match these across the five reels and ten paylines, then your luck is certainly in. It's got a wide betting range as well; you can play for as little as 10p, with a maximum bet of £100. The diamonds are the highest value standard symbols. You can get up to 200 times your payout with these, so they're the ones to go for if you can. There's only one bonus symbol – the joker hat, which activates a bonus mode that you won’t find in other slots. More on this below. Everything about this game is to the point and easy to get to grips with, and that includes the bonus mode, although it is slightly different to what you might be used to. To play to the bonus feature, you need to get more than one joker on reels two, three, or four. This turns reels one and five into wild reels, and also activates three Hot Spot positions in the other reels. If you can get three wild symbols to land in the Hot Spots, then you can multiply your stake by a cool 1,000 times. What's more, the scatters that trigger the Joker Re-spin will stay stuck on their reels, so you've got more chance of a tasty payout. Overall, this is a simple but exciting slot that's great for a few quick games (and for when you're feeling lucky). 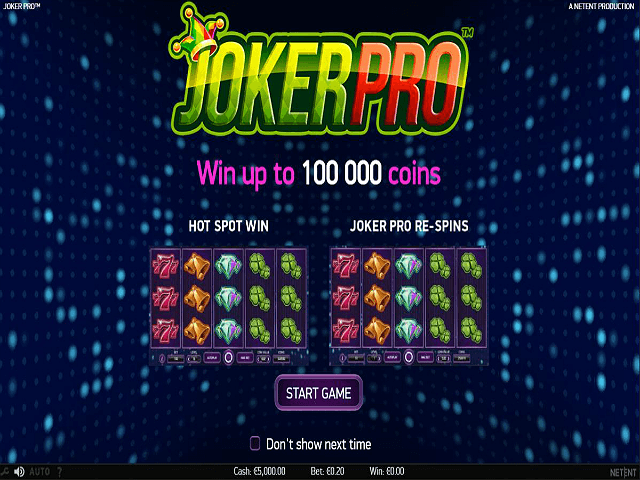 If you like Joker Pro - You'll like these slots too!